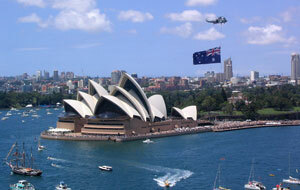 Australia Day in a holiday that occurs every January 26th. It marks the arrival of the First Fleet of British Ships at Port Jackson, New South Wales which lead to the raising of the Great Britain flag by Captain Arthur Phillip. This is a public holiday where formal ceremonies take place around the nation and then local games/activities take place locally. It is a day of remembrance and fun in the name of Australia. Captain Arthur Phillip was the first governor of the colony New South Wales to which the colony began to celebrate the anniversary of that day. It was first known 'Foundation Day' but was then changed to Australia Day in 1946.